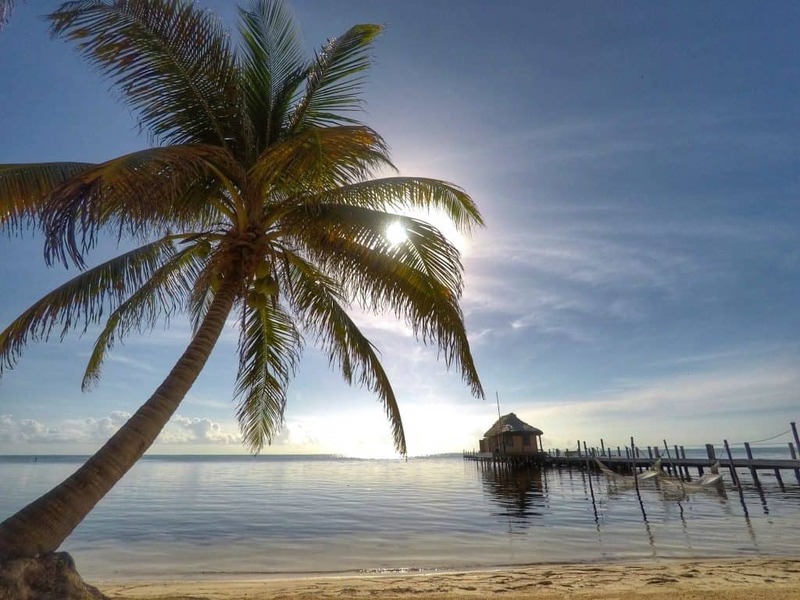 When we were researching Belize, we wanted to ensure we had a mix of experiences, especially as there is so much on offer. 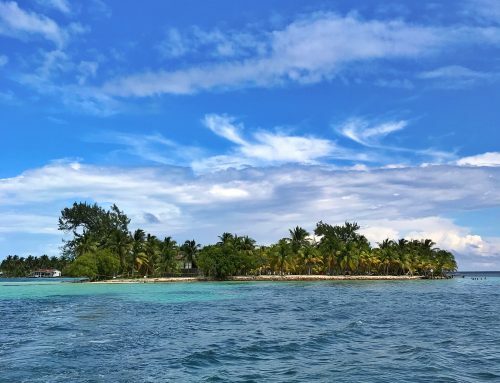 As we were arriving in Belize City and finishing our trip at the most southerly point of the country, it was obvious to start on the islands. 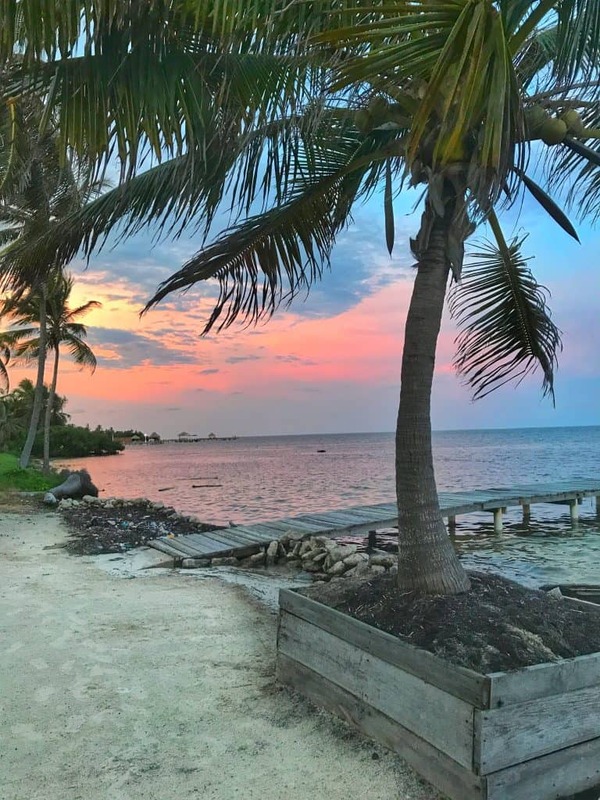 We heard a lot about Caye Caulker and San Pedro, both can be reached by ferry in an hour and a half from Belize City. 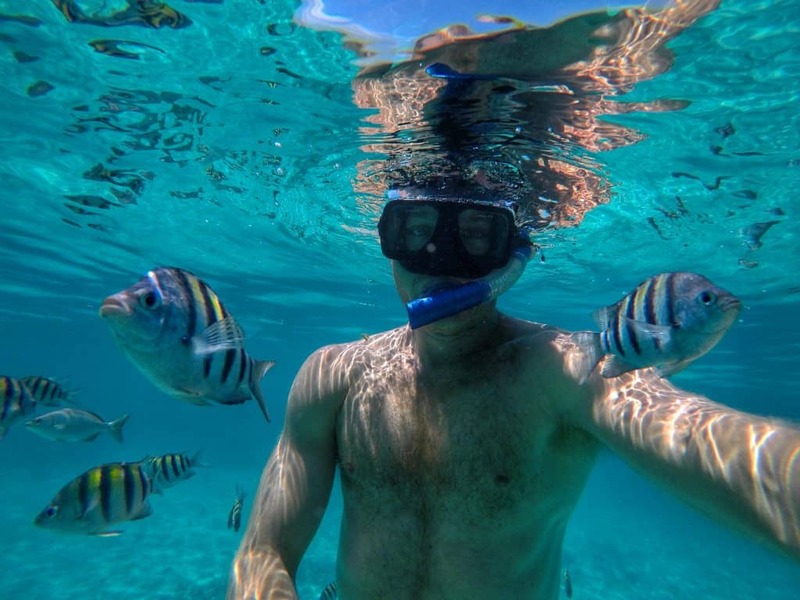 We wanted to stay somewhere quiet and relaxed, with some great snorkelling spots nearby. Portofino Beach Resort, Belize seemed like the ideal place. Owned by a Belgian couple who set up Portofino some seventeen years ago, they are very accustomed to the local cultures and traditions. 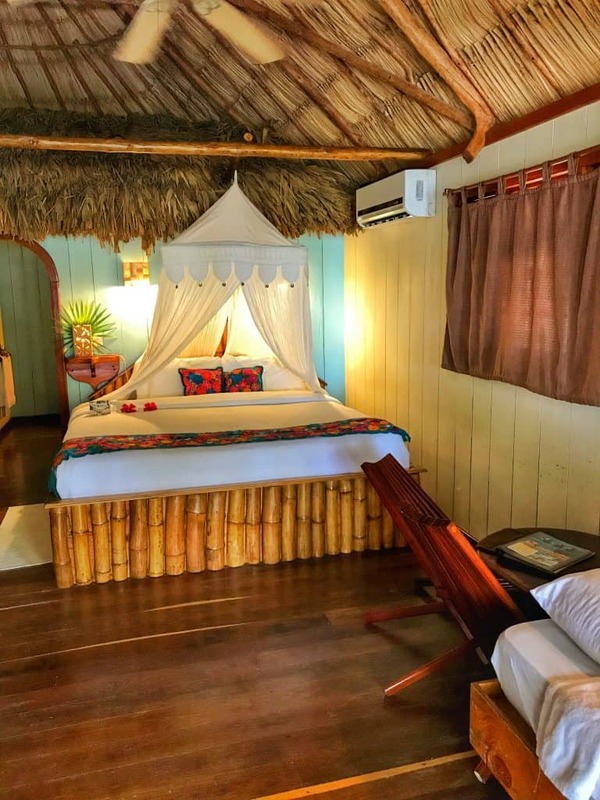 The Belizean way of life is fully embraced in their menu’s, cabana interior design and attitudes. All of the staff are Belizean and there is a real sense of family around the small and intimate resort. It’s a laid back, relaxed and informal atmosphere, making guest’s feel like they are in a ‘home away from home’. Each guest is known by name and staff make every effort to build a friendly relationship with every person. This is a totally different experience from any other resort for that reason, making it memorable. Whilst we had plenty of privacy when we wanted it, guest’s all chatted and got along which was lovely. From the moment we stepped on the Portofino Beach Resort speed boat that collected us from town, we knew our time was going to be special! We were whisked 15 minutes along the coast, skimming across the clearest aqua blue waters. I loved the boat trip alone. Once we stopped, the wind had dropped and we were feeling the sun on our skin again. We didn’t have to worry about bags or anything, they had it all in hand. Instead we were greeted with cold towels at the dock and the nicest tropical juice with lots of ice. It was so refreshing! After a speedy check-in, we were shown to our room no more than twenty steps away. That’s something I loved about Portofino Beach Resort, everything was nearby and within eyeshot which is always handy with kids. The resort is crescent shaped with several cabanas around the pool. Everything faces the aqua blue ocean. The sunset and sunrises are out of this world. 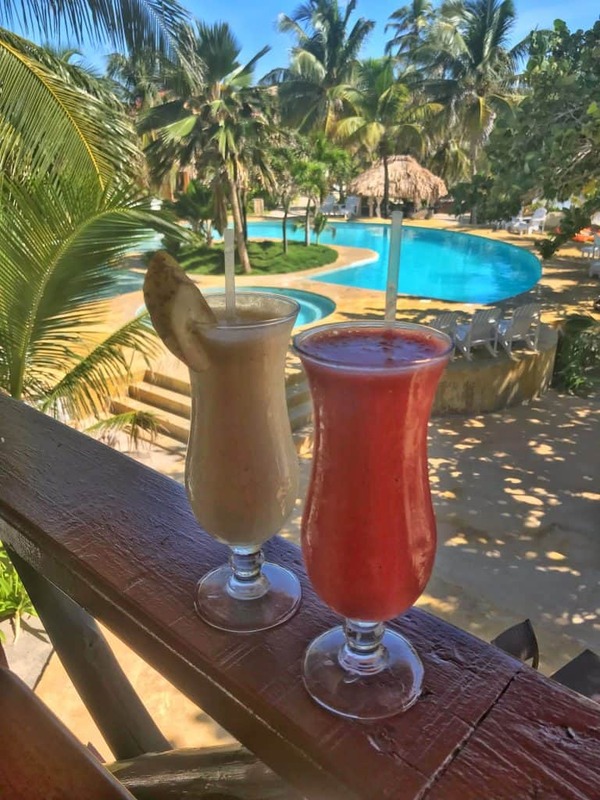 Here is our play, sleep and eat review to Portofino Beach Resort, Belize. You can’t go to Portofino Beach Resort and miss the snorkelling. Less than a kilometre by boat is Mexico Rock, a marine reserve. We saw everything we could have hoped for and more! Sea turtles, nurse sharks, parrot fish and barracuda to name a few. It was the most awesome experience. Separate from the hotel is a small snorkelling and diving company that take guests out. They are based on the dock and have all the equipment for rent. It is a little pricey at 60USD per adult for two hours. 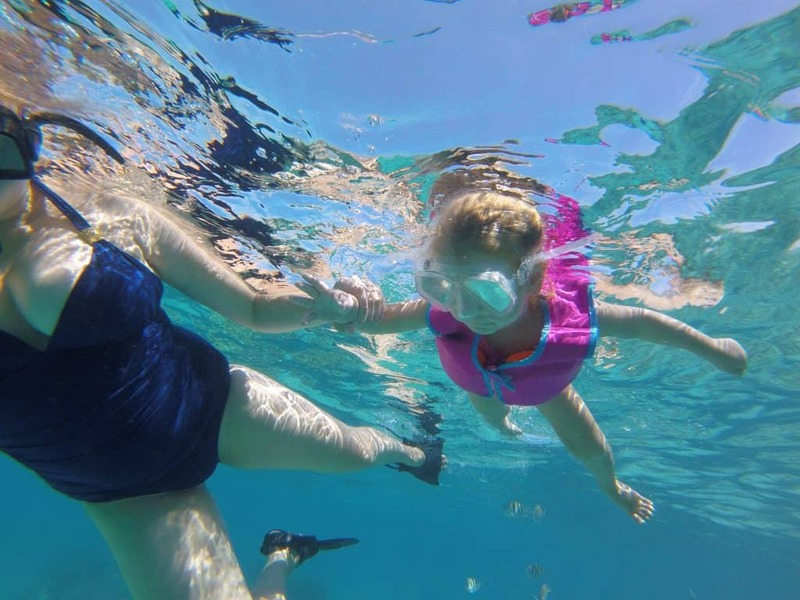 However that does include marine reserve entry, snorkel rental and the boat trip, as well as a guide, Our guide was amazing with our daughter. He was so helpful swimming alongside her whilst we too could enjoy seeing everything. All things considered the price is ok, I think it would be great if they could do a multiple trip deal so it can be enjoyed more than once. They also have diving trips and run other excursions to famous spots such as Shark Ray Alley. The resort offer kayak rentals to all guests. However tourists aren’t allowed to visit the marine reserve in a kayak because they don’t have an anchor and everyone has to have a guide. This is for protection of the reserve. They also have massage packages to all guests. There is a small hut close to the beach where the massages are done. It looks so relaxing, unfortunately we didn’t have much time with our two kids but other guests said it was really nice. The swimming pool had the ideal set up so everyone could make the most of it. The cleverly designed crescent shaped pool, gradually became deeper with plenty of shallow water for the kids. Equally the deeper end was a great size to get some good swimming action going! Our daughter spent hours and hours in the pool and we could also see her from the cabana very easily. Reception offerEco a list of other excursions they can arrange. Everything from Maya ruin exploring to diving at the blue hole, they can help. Most of those tours were quite a long day so weren’t appropriate for us with two young kids. Nearby San Pedro town can be reached by the coastal express ferry or by renting a golf cart from the resort. It seems most people get around in a cart. We stayed in a gorgeous cabana. It had a deck, a large king size bed with white drapes all around it and an extra single bed for our little one. The bed was super comfortable and was big enough to fit all four of us when the kids wanted 6am cuddles, or more to the point when we were feeling lazy. There was plenty of storage and general space around the room for our luggage. The bathroom was massive with a walk-in shower, big vanity area and separate toilet. Their attempt at being Eco-friendly was obvious from the products that are in refillable wooden pots rather than plastic bottles. They were topped up daily with shower gel, shampoo and conditioner and all felt and smelt luxurious. There was also a fridge in the room that was stocked daily with bottled water. We also found it useful for some snacks and my husbands insulin medicines. The onsite restaurant is just above the bar and reception area. As its upstairs, it has an elevated view of the dock. As the resort is so relaxed, we were told we could order and sit wherever we wanted, as the staff would bring the food to us. I found that really helpful, especially on witching hour when the kids were tired and they just needed to eat before bedding down. The staff always brought our dinner to our room. They have an A La Carte for breakfast, lunch and dinner menu. There were also tapas available for snacks in the afternoon. Breakfast had everything from fresh fruit smoothies and granola to bagels and muffins. I loved the tropical smoothies, I literally had one every morning! For lunch they had options such as fish and chips, burgers and salads. However it was the signature dishes at dinner that were really tasty. 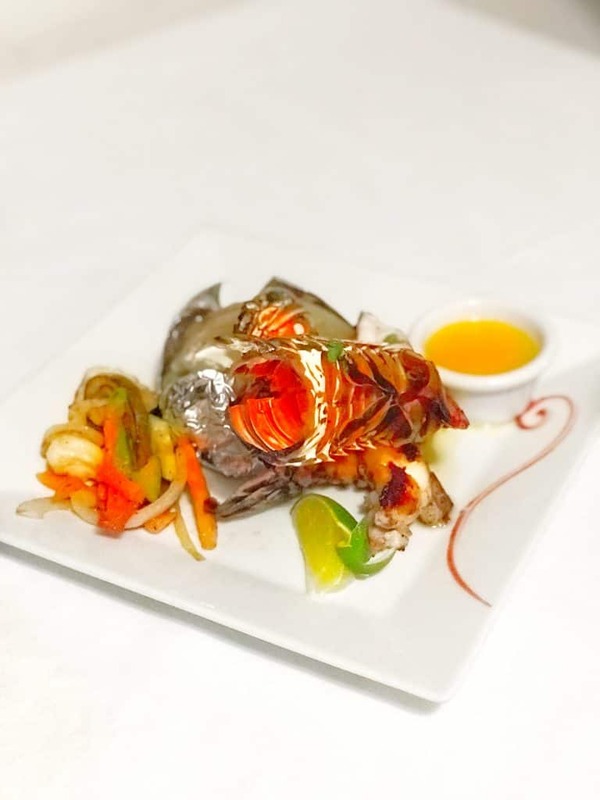 Seafood featured heavily on the dinner menu with options of barbecued lobster, almond and onion encrusted snapper with jasmine rice. They also had rib eye steak that hubby loved. The only issue with the meals is they are quite big for kids. In an ideal scenario, there would be a kids menu with a few healthy options to reduce waste. That said, our daughter took a liking to the fish and chips which she had almost every evening. If she’s eating, Im happy! Sunday is a special day at the resort as they always have a BBQ. Another lovely touch for couples is they arranged beach front candle lit dinner for guests. We saw them set up a few times with flowers, tea lights, white table cloth and so on. It was so beautiful. 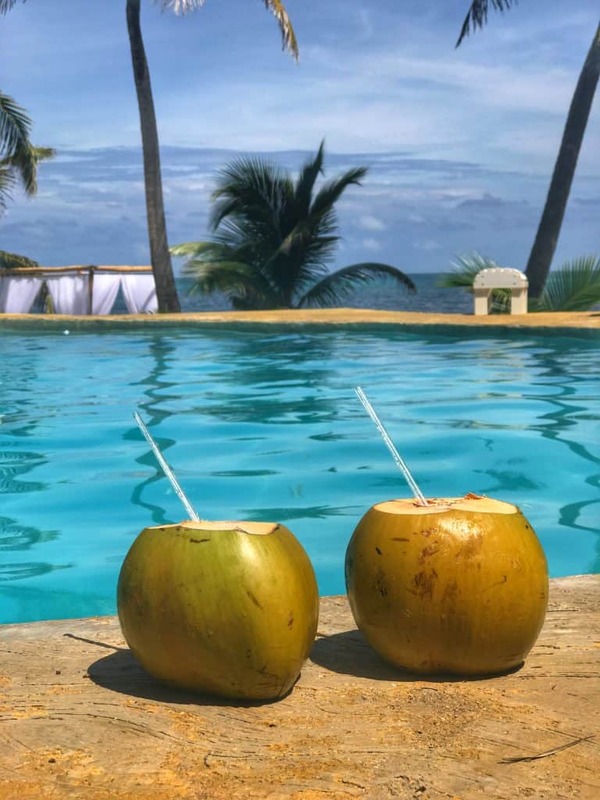 You can’t go to a tropical destination without having a cocktail by the pool right? They had an extensive cocktail list, not that I sampled it all, but I did love the Mai Tai and Pina Colada. For rates and availability, click here. 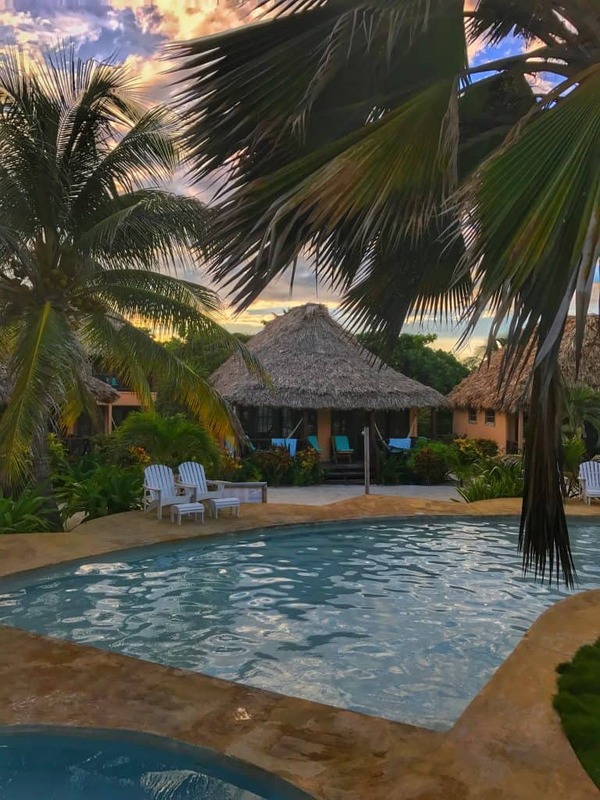 I hope you found the review of Portofino Beach Resort, Belize helpful? Leave a comment, I love to hear from you. Disclaimer: Our stay was hosted by Portofino Beach Resort in return for a review. As always, all views are entirely our own. This looks like a lovely, intimate, family friendly resort. Thanks for sharing such a detailed review. 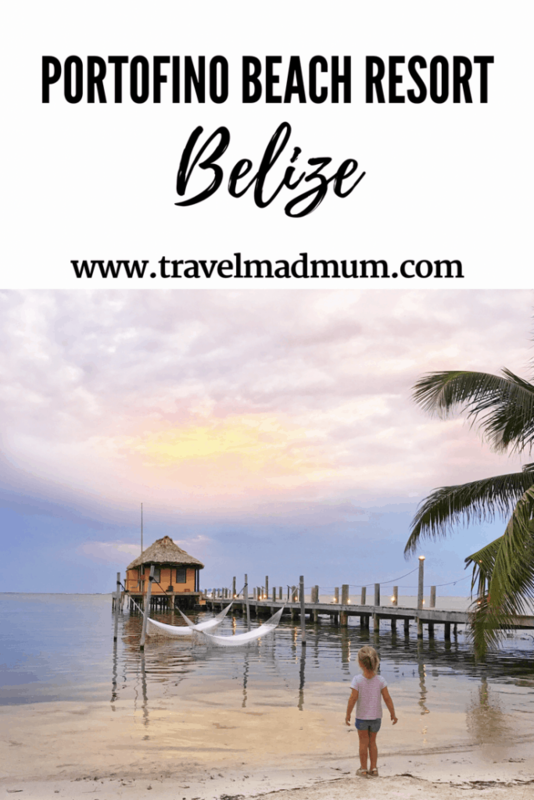 Belize is on our list – we got to visit on a cruise ship stop a number of years ago (before kids) and it seemed like a lovey country. Can’t wait to take the kids back there!